Education is a theme designed for schools that organize online courses and offer a complete e-leaning education service. The single course page contains all the information that the school needs to communicate to their students and there is a course payment system integrated with PayPal. 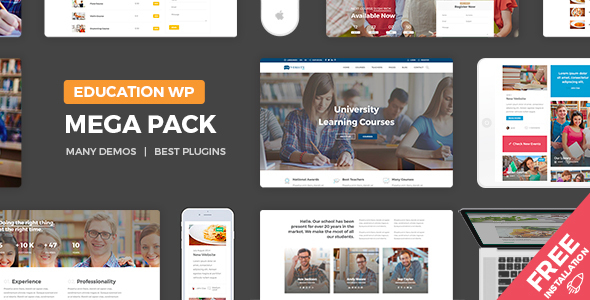 This education theme also includes the management of single teachers who will have a custom page to show their courses, contacts, and all education material. The teacher in this way will be able to share education material on his page that will be immediately visible to his students. The students can also leave a rating for each course and in the teacher page the user can see the global rating of all teacher courses. The e-learning courses will be filtered through a search box that will filter the courses by category, date and type and the individual course page will contain the course program, the education material of the course and students will be able to leave a rating for the course . Education theme fit fo cooking schools that hold classes but is also suitable as a promotional site for an individual teacher, single course, driving school, English school, language school, psychology courses and so on. The theme provides a cart for the purchase of the courses and the users can pay the course in few easy steps through Paypal and start learning.